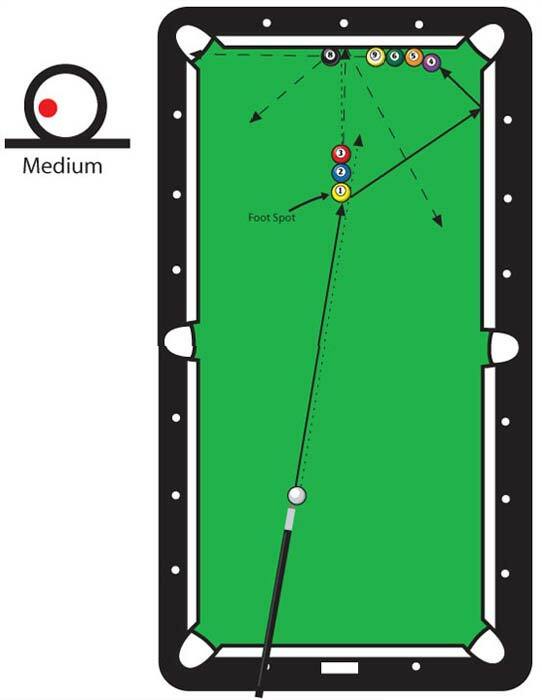 Jop’s version of an old clearance shot where you hit the 1 ball, clear the eight off the rail and make the 9 in the left corner pocket. Start with the 1 on the foot spot and line up the 1,2, and 3 with diamond 7. Place the 5 on the foot-rail at diamond 6 and line up the 5, 6 and 9. Freeze the 4 to the 5 about 1/2 inch off the rail. Position the 8 on the left side of diamond 7 so that the 3 will knock it away without getting a kiss. The 8 banks to the left while the 3 banks to the right. Opening up the path for the oncoming 9. To make the shot, place “whitey” as indicated. Try to carom off the 1 hitting the rail below diamond 1 and hit the 4 right in the nose.